Marks the third time in two years data center operator has increased the quarterly payout to shareholders. Investors might find it fabulous that DuPont Fabros Technology (NYSE:DFT) has increased its second-quarter dividend, the third time in two years the payout has been increased. At the same time as its first-quarter earnings report, the data center operator announced today that it had increased its distribution to shareholders to $0.25 per share, representing a 25% increase from the company's first-quarter payout of $0.20 per share. DuPont Fabros CEO Hossein Fateh said: "Our refinancing activity in the quarter reduced our overall cost of capital and improved our debt maturity schedule. This focused activity and confidence in leasing supports our board's decision to increase our common stock dividend by 25%." The new payout annualizes to $1.00 per share and yields 3.9% based on the closing price of DuPont Fabros Technology's stock on May 6. DFT Dividend data by YCharts. Chart does not reflect the new, higher dividend. announcement. 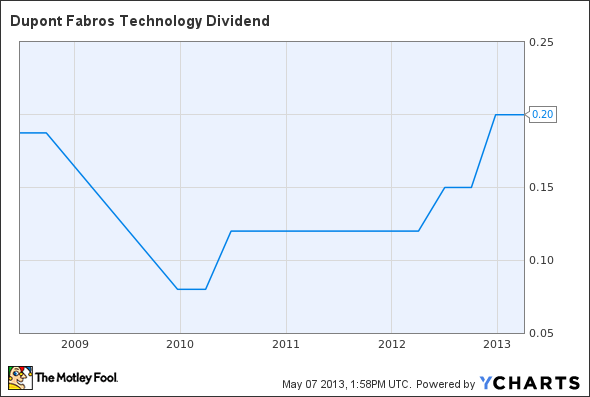 Better Dividend Stock: Digital Realty Trust or DuPont Fabros Technology?